Wild wolves once roamed all over the British Isles, but have long since disappeared due to humans hunting them to extinction. Even so, they are still part of the old Celtic legends and mythology. 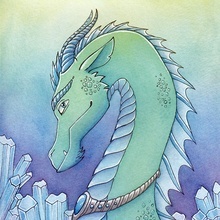 The original artwork was created with watercolour and coloured pencil on paper. Hello! I’m Karen — a Canadian artist residing on Vancouver Island, British Columbia. I’ve been an artist in some degree for as long as I can remember. With my artwork, I want to uncover the innate magic of nature. I am particularly drawn to animals and birds, and interested in the roles they play in different cultures. Sometimes I just like to draw pretty things.